All Evie wants is to be normal. She’s almost off her meds and at a new college where no one knows her as the girl-who-went-crazy. Evie’s been the ‘crazy girl’ throughout school when her OCD took hold of her and everyone viewed as that and that alone. Now she has a fresh start she’s under control, apart from her annoying therapist, no one knows about her past so now she wants to be normal. The thing is normal isn’t as easy as it looks she needs to find some friends, find a boyfriend and have absolutely no one find out. Oh and getting rid of the medication is a good deal too. This is the second of Holly’s novels that I’ve ready and she solidified her place in my top 5 authors of all time. There is no doubt that Holly can write but the most amazing thing is that she can make the mind of a teenager come alive on the pages. 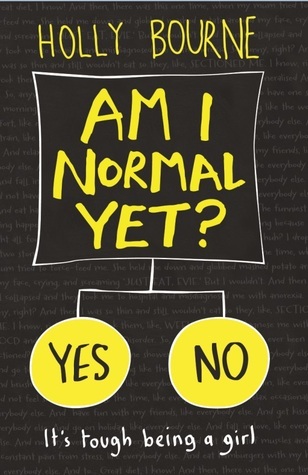 Am I Normal Yet is different though because it also raises awareness of what it’s really like to live with a mental health condition as a young person right now. The medication debate is a big one too and I’m really pleased at it is finally in literature for young adults. Medication is a strongly debated subject specifically in regards to young people, it seems that everyone has an opinion on this and they don’t really understand. Medication is a very personal choice for some people it works, for some people it doesn’t I’ve met people on both sides. It’s sad that people are made to feel like they are somehow ‘fake’ if they take medication to help stabilize their illness, you wouldn’t ask a diabetic to stop taking their insulin. There was also something unexpected in the novel too, it talks about feminism in a totally unapologetic way the girls aren’t just going out of their way to meet boys or talk about boys. In fact that’s even a point in the novel they swear to have conversations that don’t even mention boys. It’s actually pretty refreshing, of course relationships feature but they’re not the absolute only thing. Of course I’m giving this novel five stars *****. Bourne is one of my favourite authors for a reason and I think I love Am I Normal Yet more than I did The Manifesto on how to be Interesting (check out that review too if you like the sound of Holly, she won’t dissapoint). Holly has a third book that I am yet to read which was her debut called Soulmates, so I’ll be reading and reviewing that soon too. As always well done Holly another fantastic novel.